Child sacrifice in Uganda is on the increase. This is an intensely disturbing phenomenon that is driven by superstition, exploitation, witchcraft, and extreme poverty. We acknowledge the steps already taken by the Ugandan government to tackle this issue and invite you to join us in support of these efforts by signing our petition. This petition is supported by the Ugandan children in Kyampisi and is the petition mentioned in the original BBC news report. We will send you occasional email news updates. 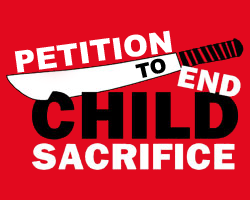 We the undersigned petition President Yoweri Museveni of Uganda and The Speaker of Ugandan Parliament to use all the influence of your high offices to end this 21st century evil and introduce a new law to protect children from the crime of Child Sacrifice.